It’s another Snow Day here in Central Ohio. The measly 3 to 5 inches we received overnight pales in comparison to the “historic” storm they are about to get in NYC, Boston & Philly. One reason I like living where I do is that we get Snow Days without paralyzing snow. And we’ve already had three of them in January! It’s been a while since Tera, Rachel or I have been able to post. It goes without saying that a teacher’s life is a full life! My to-do list, which always includes posting here, always seems to get longer and not shorter. I’ve been collecting links and ideas though. Hopefully I can post a few today when I’m not catching up on evaluating student work. This poster is one of many resources found here. 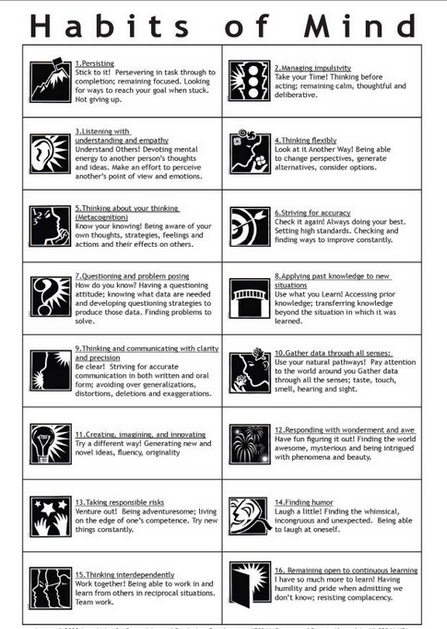 I like the dozen and a half skills listed, but I think a critical one is omitted here and in most lists of 21st Century Skills – Attention or Mindfulness. A fact of modern life is the temptation to becoming distracted from the task at hand – be it participating in class, doing homework, or even driving. The dangers of “distracted driving” were driven home to our school recently when speakers from Impact Teen Driving shared their tragic story of a loved one’s death from an auto accident by a distracted driver. Focusing attention is a skill that can be taught and developed. An M.D. from the esteemed Mayo Clinic featured in this Atlantic article writes: “We have multiple set exercises throughout the day where you basically bring intentionality to your attention…they involve no newfangled brain-training software, or really anything at all new to neuroscience or philosophy.” His website, stressfree.org offers useful techniques illustrated by engaging videos to teach the five core principles of “gratitude, compassion, acceptance, meaning, and forgiveness.” He’s created this fact-filled, cute, whiteboard video entitled “A Very Happy Brain” that could be enjoyed even by younger students. Cultivating gratitude, being in the present moment, and mindful meditation have been shown to have many psychological, academic, and inter-personal benefits. There are no shortage of succinct articles which both describe the benefits of mindfulness and offer ways to practice meditation. So how does this relate to educational technology? There are a growing number of apps which can facilitate meditative practice. Aside from using technology to teach meditation, I think we also need to educate our students in ways to be attentive to assigned learning tasks rather than succumbing to the massive temptation to distraction living within their iPads or Chromebooks. 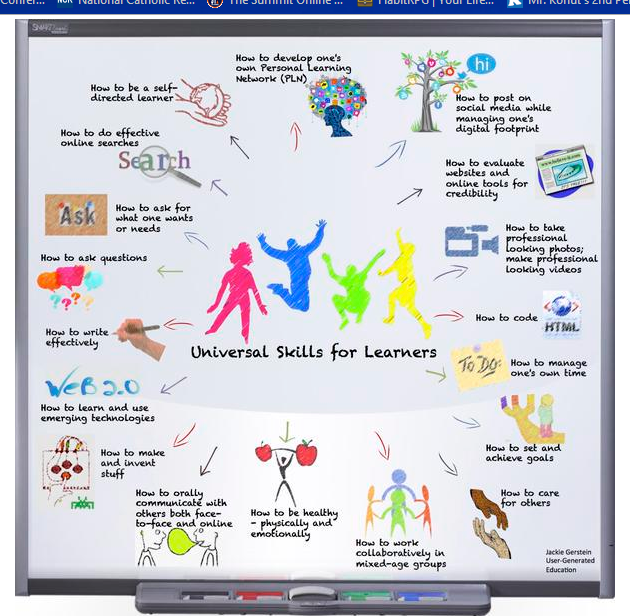 This attentiveness is a vital 21st Century Skill on par with any of the other essential skills listed on the posters above. So, how do we teach it? In the next post, I’ll share how I am doing it in my classroom. How have you done it in yours? It’s a new calendar year and time to get more organized. In case you’re not yet using an app to organize your tasks (or if you’re looking to make a change), here’s a very recent review of the best apps for this job. I’ve previously used two listed at the link above. Any.do is free, simple, clean and extremely easy to use. It integrates with a calendar app offered by the same designer. Rewards are given as a certain number of tasks are completed. These “rewards,” while occasionally useful, are essentially coupons for products from the sponsors of the app. It’s advertising, albeit in a limited, backdoor way. Wunderlist seems to be the “gold standard” of the free To Do list apps. 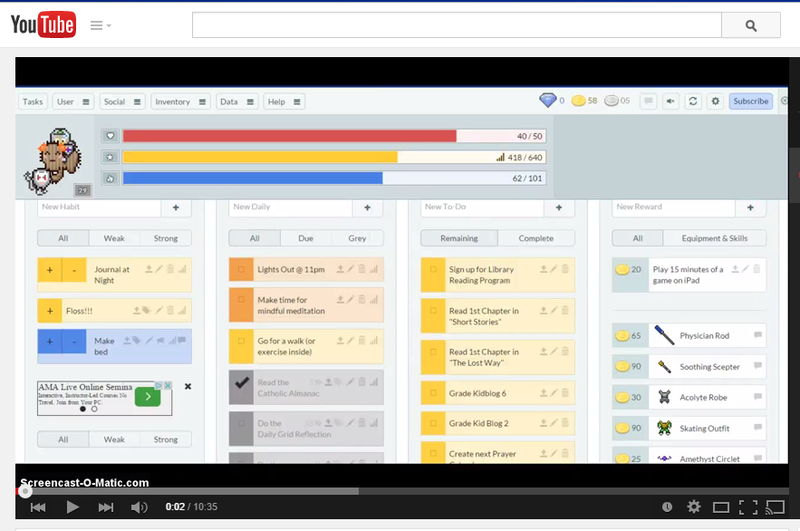 It has many options, calendar integration, robust “unlockable” paid functionality and more. Additionally, it appears to have numerous professional, collaborative features. I like my To Do list to be a platform from which I feel rewarded as I make progress through my tasks. It helps me to be more organized and productive if there’s a sense of fun and levity as well. 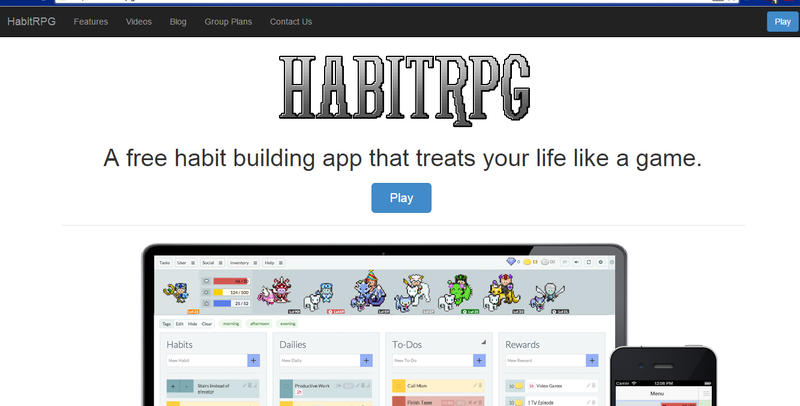 While I’ve used both Any.do and Wunderlist, my daily choice for the last few months has been HabitRPG. I’ve placed my comments on it as well as a guided tour of it within this video that I hope you’ll view. Enjoy and best wishes for your own productivity in 2015!